February 2, 2017 by David Shields. Average Reading Time: about 2 minutes. Expanded No 1, No 2, and No 3 were three wood types released by Wm H Page & Co and first shown in the company’s April 1867 specimen catalog. The faces were each embellished variations of Antique Tuscan Expanded that Page & Co had first listed on their 1865 published price list. The design is slightly more condensed than Antique Tuscan Extended which Page & Co showed in their May 1860 catalog. The extended variant of the Antique Tuscan was first shown as wood type in America by Wells & Webb in their 1854 specimen catalog as Extended Antique Tuscan. 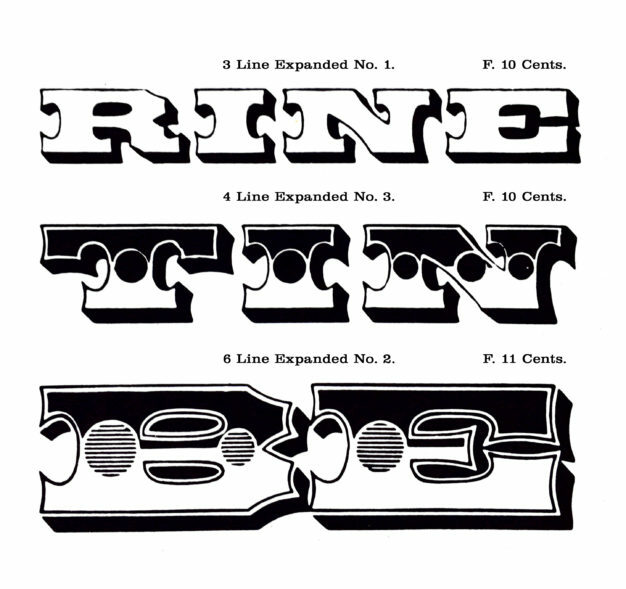 Expanded No 1, No 2, and No 3 were first shown as two-color chromatic wood type in Page’s April 1867 specimen catalog. Expanded No 1 was the outlined and drop-shadowed variant of Antique Tuscan Expanded. Expanded No 2 followed No 1’s outline and drop shadow but also included a solid fill in the top portion of the letter and a large medial dot. The medial dot was lined. Expanded No 3 followed all of the characteristics of No 2 but the medial dot was solid. The April 1867 specimen catalog’s price list also included a design named Expanded No 5. That design was, curiously, not shown in any of the known specimen catalogs produced by Page. The July 1870 specimen catalog also introduced Expanded No 4 and No 6 on the price page, but, like Expanded No 5 were not shown as specimens. 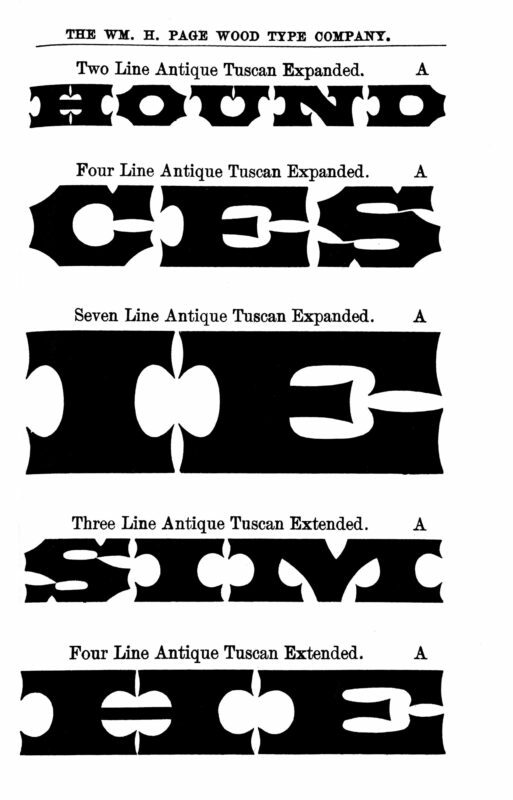 Expanded No 1, No 2, No 3, and No 5 were listed as price Class F, and Expanded No 4 and No 6 were listed as price Class E. Expanded No 1, No 2, and No 3 were each offered chromatically in the 1874 Specimens of Chromatic Wood Type, Borders, &c manufactured by Wm H Page & Co, Greenville, Conn. When The Hamilton Mfg Co acquired the Wm H Page Wood Type Co in 1891, Hamilton changed the names of all the designs. Antique Tuscan Expanded became No 4015; Expanded No 1 became No 347; Expanded No 2 became No 438 and Expanded No 3 became No 437. Hamilton did show all three designs as single color options up until Catalog No 16 of 1906. Page’s Expanded No 4, No 5 and No 6 were never listed or shown in any Hamilton specimen catalog.